Home Latest News Slider World News Fastjet expands its fleet to four planes with plans for more. Fastjet expands its fleet to four planes with plans for more. African budget airline, Fastjet (LON:FJET), has signed a letter of intent with ICBC International Leasing Company Limited in respect of the leasing of one A319-131 aircraft. The airline plans to increase its fleet this year as it seeks to expand its operations and add further routes to its network. With fastjet's current fleet of three aircraft almost fully utilised, additional aircraft will be required to support the planned expansion of fastjet Tanzania and to facilitate the start-up of planned new fastjet operations in both Zambia and Zimbabwe. 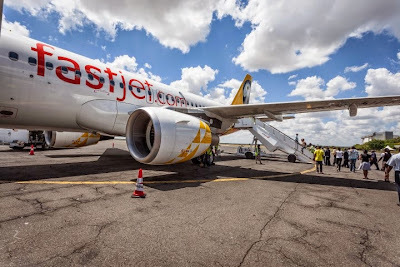 This Aircraft is the first of a number that fastjet is planning to add to its fleet this year, with each additional aircraft able to make up to 1,000 more seats per day available to fastjet's customers. Based on the 75% load factors currently being projected by fastjet, each aircraft in the fleet is expected to carry approximately 275,000 passengers per annum. fastjet expects to put the Aircraft into service in the third quarter of 2015, subject to entering into a lease agreement with certain conditions being met, including the reconfiguration of seating and painting in fastjet livery. Ed Winter, fastjet Chief Executive Officer, said: "It will be a strong step forward to add another aircraft to our fleet and embark on our planned expansion funded by our recent £50 million placing. We are currently negotiating to bring further aircraft into the fleet." As previously announced, the Company's target is to have up to 34 aircraft operating to 40 destinations within and from Tanzania, Zambia, Zimbabwe, South Africa, Kenya and Uganda by the end of 2018.